After seeing Sweeney Todd at the Patriot Cinema in East Providence, Mom and I decided to take my friend Janine's suggestion and visit El Azteca in neighboring Rumford. I've been dying to try it for months since I adore Mexican food, and Mom was looking forward to it as well. We pulled into the unusually icy parking lot at around 6 p.m. The reason I say unusually icy is because, although it snowed on Friday, all nearby parking lots had been cleared. 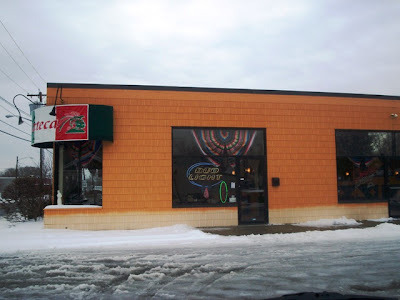 El Azteca's was covered in slush. Also, their parking lot is rather small, and because this seems to be a popular restaurant located on a very busy street, it fills up fast. We had to wait for one of the diners to exit so we could steal their spot and make our way very carefully toward the front door. When we got inside, we were greeted by a friendly waiter. Mom asked for a table, not knowing that all they have is tables. Duh! He brought us to the very back table in the corner of the main dining area. It was darker than normal there, but I like that because it always makes for a cozy dining experience. Our host left two pleather covered menus on the table for us to browse through. Before we knew it, a waiter had come over to bring us a basket of tortilla chips and a bowl of salsa. He even left the bottle on the table in case we ran out. Both Mom and I thought the chips and salsa were good, but nothing special. I spotted a waitress making her way over to our table. When she got to us, she just stood there. She didn't say a word, but she had her pen ready to write down our drink order. I looked over at Mom, and she said, "Diet Pepsi or Coke." I said, "Same." The waitress smiled and walked away. I had a funny feeling that she may not speak English very well, and decided to nix any unnecessary talking. She didn't even give us her name! Either way, the silent waitress returned quickly with two diet sodas in plastic cups. Ready to take our order, I asked her for another minute so Mom and I could review the menu. Ah, the menu. What a story. Half way through the browsing, Mom exclaimed, "I can't read this." At first I didn't know what she was talking about. She was spending a lot of time staring at that menu. She explained that she was having a problem seeing the red type against the orange background. Plus, we were in a shaded area. Needless to say, there was a problem. She had even suggested that I pick something for her that I knew she would like. When we had first walked in, I grabbed a take-out menu from the front desk. Reaching for my purse, I pulled out the take-out menu and handed it to Mom. "Is that better," I asked. She said, "A little." Because the take-out menu uses a red font on a red background, reading that was very difficult as well! Even I found myself straining to read the original menu. I had to place it on the table in order for the overhead light to fall upon it. After we spotted what we wanted to order, the waitress returned. 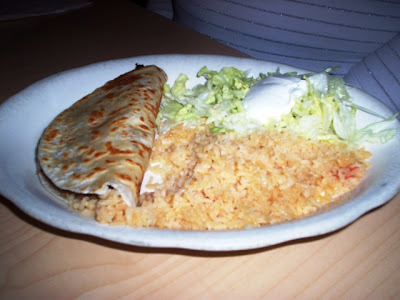 Mom chose the Quesadilla Rellena Roja ($6.50), which is a stuffed cheese quesadilla with a choice of ground beef, beef tips, shredded beef, chicken, or refried beans topped with fresh lettuce, tomatoes, sour cream, and supreme sauce. Mom asked for ground beef with no tomatoes. I chose the Burritos De Luxe ($7), which is an order of two burritos - one chicken and beans, one beef and beans - topped with lettuce, tomatoes, and sour cream. The waitress took away our menus and left Mom and I to check out the interior. Mexican restaurants are always decorated with a lot of style and pizzazz. This one, although more plain than some, had all the right embellishments. Beautiful tapestries with sombreros topped each large window overlooking the street, while upbeat Mexican music played in the background. Lighted sconces sat in between framed photos against white walls, while lighted beer signs advertised the various drinks offered at El Azteca. A tile floor helps to keep this restaurant clean, while the ceiling fans help to cool customers who may have had too much hot sauce. There are no booths here, but there is a large bench seat with tables against the largest wall in the dining area. The wait staff was dressed in either a purple or white El Azteca t-shirt, which I think makes the crew look professional. A margarita list sat upon each table to tempt diners into purchasing one of these delicious drinks - and boy did they look fantastic going by. Also going by were sizzling plates of meat. The smell was very intoxicating, and I couldn't wait to dig into my meal. I don't even think I finished taking my notes before Mom and I were presented with our meals. It had to be one of the fastest services we've ever seen. The waitress actually spoke to us this time around when she warned us about the hot plates. Both dishes looked and smelled great. Accompanied by a side of yellow rice, Mom said her quesadilla was very tasty. However, after eating it, she realized that it lacked the distinctive Mexican flavors that were usually in this type of dish. She did not find her meal spicy at all. It was almost like having a piece of meat pie, which is fine, but didn't taste Mexican. She liked the little pile of shredded lettuce and cool scoop of sour cream that came on the side along with the rice. Mom really enjoyed it, and she said that she would order it again ... but the spice was just not there. I felt the same way about my burritos. In fact, my dish wasn't exciting at all. The taste was good, and I enjoyed the fresh tomato, lettuce, and sour cream that sat on top of the two burritos. However, I think I was expecting something different. For some reason, I was picturing two burritos that you could pick up and eat with your hands. 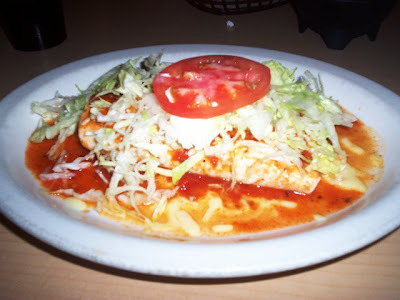 What I received was something that resembled an enchilada, which is a softer food that is not meant to be held. Like Mom's, my dish also lacked spice. Although the taste wasn't bad, I've had better. After Mom and I cleared our plates, Mom brought up dessert. One of the few things she was able to spot on the menu was a sopapilla with ice cream. A sopapilla is a piece of fried dough topped with cinnamon and sugar. When the waitress returned to take away the dishes, Mom ordered this dessert. The dessert took longer to arrive than the actual meal did. My guess is that they were frying the sopapilla to order. When it was ready, the waitress brought it over. 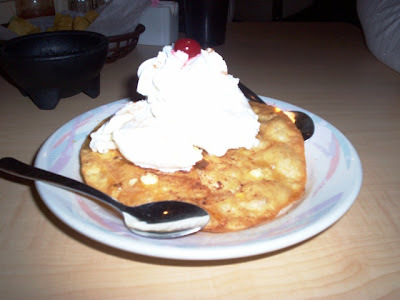 Topped with two scoops of vanilla ice cream, whipped cream, and a cherry, this sopapilla was fried flat instead of puffy. It was crisp and formed a nice shell to hold the ice cream. It was very tasty, crunched apart when you broke it with your spoon, and both Mom and I enjoyed it - and the ice cream - very much. It was a nice ending to our meal. There are a lot of delicious looking things on the menu at El Azteca. Appetizers, or entremeses, include the guacamole dip ($3), nachos with beef and beans ($5.75), and the special nachos ($6.95), which come with beef, lettuce, tomatoes, and sour cream. Salads, or ensaladas, include the taco salad ($5.75), the guacamole salad ($3.75), and the fiesta salad ($5.50), which includes grilled shrimp, fresh lettuce, mushrooms, onions, green peppers, tomatoes, shredded cheese, and your choice of dressing. Quesadillas include the cheese ($2.95), spinach and cheese ($3.50), and shrimp ($4.50). Vegetarian combos include the vegetarian fajitas ($8.95), and the bean burrito, cheese enchilada, and rice ($6.75). Specialties, or especialties, include the El Azteca ($9.95), which is a t-bone steak cooked with bell peppers, onions, tomatoes, and spices served with rice, beans and tortillas; Las Divas ($7.95), which is four chicken enchiladas with a special topping of salsa, lettuce, tomatoes, and sour cream; and Texas fajitas ($11.75), which is tender beef, chicken, and shrimp cooked with onions, tomatoes, and bell peppers served with rice and beans with cheese, guacamole salad, sour cream, and your choice of flour or corn tortillas. El Azteca also has something that is quite fun. You can order a combination dinner including your choice of three foods such as a taco, enchilada, chalupa, tostada, burrito, chile relleno, tamale, and a tostaguac. The margarita prices aren't bad, either. The regular is $4.95, but for $9.50 you can order a small pitcher. You can even splurge and order a large pitcher for $18. El Azteca also has a large list of side orders and luncheon specials which you can order until 3 p.m. Monday through Saturday. They even feature a few breakfast burritos for those of you looking to start your morning with something spicy. There is also a children's menu, and a menu for "gringos" which includes hamburgers ($3.50), cheeseburgers ($3.95), and chicken fingers ($3.95) served with fries if, for some reason, you have to be difficult and order something non-Mexican. I left $25 on the table in the check holder for the waitress, including 20% tip. Although very quiet, she was a good waitress. Like I said, there may have been a language barrier that she tried to avoid. Mom and I said goodbye to the waiters that were standing near the door as we made our way through the icy parking lot to my car. We did not use the restroom on this visit. Mom and I enjoyed our dinner at El Azteca. Although it wasn't the most exciting Mexican food we've ever had, the ingredients were very fresh and the atmosphere was quite fun. Next time we're definitely getting one of those margaritas. ¡Arriba! 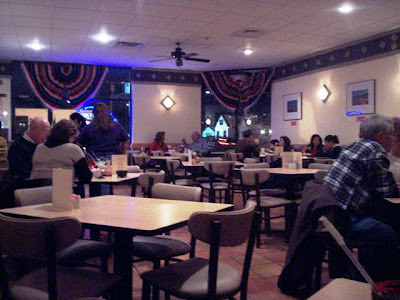 El Azteca is open from 11 a.m. to 9:30 p.m. Monday through Thursday, from 11 a.m. to 10:30 p.m. Friday and Saturday, and 12-9:30 p.m. on Sunday.